bringing this to the attention of CWU Branches. and share this information with colleagues. “If you don’t write your story yourself, someone else will do it for you. So you’ve got to get out there and write it,” (Benjamin Zephaniah). In the past few months we have seen a number of media stories placing the blame on the working class for a whole range of society’s ills, from Brexit to Donald Trump. Typically the working class have been ignored and even told that they don’t exist for decades and then all of a sudden we are rediscovered – in order to be made a convenient scapegoat for the wider failings of our political and economic system. Our culture and media are increasingly dominated by middle and upper class voices. It is time for that to change. The CWU Education & Training Department have launched the Workers’ Writes creative writing competition in order to encourage CWU members to feel confident in expressing ourselves and telling our stories. The competition is open to all members from now until 1st March 2017. Write a short story, poem or other form of creative writing around the theme of ‘Making My Mark’. Entries can be up to a maximum of 1,000 words – or as few as you need. They can be funny, sad, moving, angry – whatever you want them to be. Entrants must ensure that they include their name, contact details and CWU Branch. The competition is supported by Express Yourself, an online course on CWU Left Click. A poster advertising both is attached to this document. Could all branches please circulate to encourage maximum participation. Following press coverage this morning announcing that Ofcom is proceeding with a formal notification to require the legal separation of Openreach from BT. Please find attached a briefing to members which should be distributed as soon as possible. Any enquiries in relation to this LTB please contact nmarshall@cwu.org. Firstly, I would like to thank all regions and branches who have supported the Postcard Campaign so far. The response has been fantastic and we know branches have collected thousands of signatures already. You will be aware that further strike action has been called for this Saturday, 3rd December 2016. With this in mind, and to maximise the levels of returns on our postcards, we are calling a National Day of Campaigning on Saturday. All branches, including those without Post Office members should target at least one big workplace or a local area of high footfall (high street or town centre, if you have no Crown Office) and collect as many signatures as possible for the campaign. This day of action should be viewed as a priority commitment. If branches need additional postcards in order to carry out this work, please email Marcia Murray mmurray@cwu.org as a matter of urgency. Finally, we ask that Branches share videos and photos from the day of activity (and throughout this campaign) using #PeoplesPost on social media. Eastern Labour backs CWU Post Office struggleUnanimous support for the fight to save our Post Office and hundreds of signatures on CWU campaign post cards added up to a “huge success” at this weekend’s Labour East Regional Conference in Southend, reports Paul Moffatt. A proposition setting out the union’s strategy for overcoming the crisis in the Post Office was formally moved by Paul, CWU Eastern Region secretary, seconded by regional political committee chair Andy Beeby and adopted as a resolution by the conference, which also heard supporting speeches from Kelvin Hopkins MP and Richard Howitt MEP. In a hard-hitting address to delegates, Paul Moffat highlighted the Government’s privatisation of the Post Office through branch closures and franchising-out of services, the drastic consequences this is having and will continue to have on vulnerable people in society, on rural communities, and the damaging impact on workers’ terms and conditions. The resolution calls for the immediate halt to franchising and closure programme and for the government to develop a new strategy with the introduction of a national post bank through the Post Office network. In moving the proposed resolution, the CWU also called for the Regional Labour Party executive to make a submission to the Government’s consultation on the Post Office. “The conference was a huge success,” Paul said, adding: “As well as the welcome support for our motion, over 250 Post Office in Crisis Post cards were signed and handed back by delegates personally pledging their support for our campaign to save the Post Office from destruction. Paul added that he had also been “extremely pleased to welcome back the fire brigades union FBU,” which has recently re-affiliated to the Labour Party. 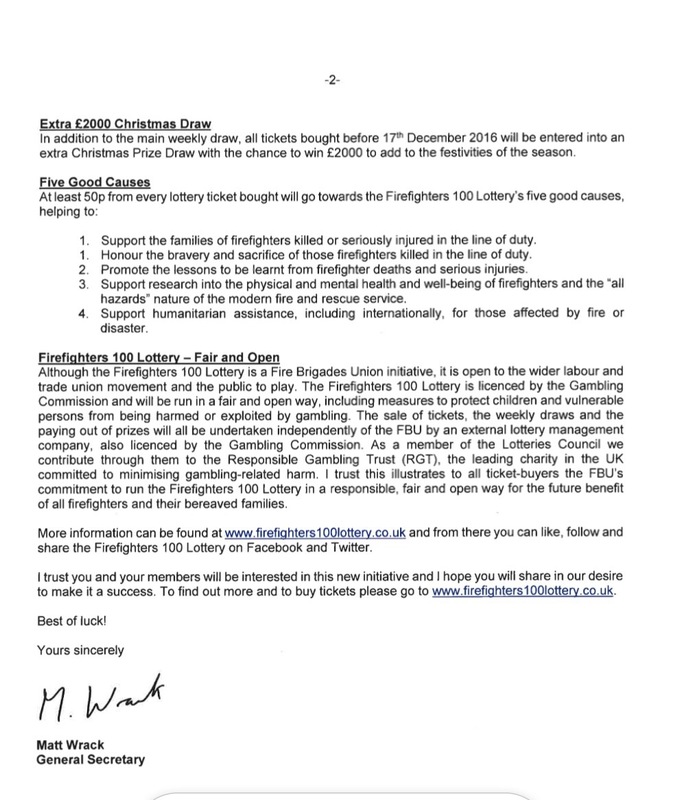 “Our FBU comrades wholeheartedly supported our resolution and we were proud to second the FBU’s resolution on cuts to fire and rescue services,” he said. Further to LTB 585/15, it is with profound sadness that I have to advise you that Paul Maloney, Branch Chair, Birmingham District Amal Branch passed away on Saturday 19th November 2016. Paul was 53 years of age and had recently suffered a number of serious health issues, including sepsis and had been hospitalised twice, most recently at the start of November after contracting MRSA. Unfortunately, Paul was unable to survive these serious health issues and passed away peacefully at the Queen Elizabeth Hospital, Birmingham. Paul leaves a wife, Jackie and three daughters, Laura, Kate and Helen. Paul will be remembered as an inspirational man who met his life changing challenges with great dignity and humour. I know that he will be sorely missed by all his friends and colleagues in the union. At this sad time our thoughts are of course with Paul’s wife, daughters and all his close family and friends. I will on behalf of the CWU convey our deepest sympathy and condolences to them. We would wish to take this opportunity to thank Branches, Reps and members for all of the support given to Paul in so many ways. This support meant so much to Paul, his family and the Birmingham District Amal Branch. A further LTB will be issued detailing funeral arrangements for Paul in due course. If you have any enquiries on this LTB, these should be addressed to the General Secretary’s Office at gsoffice@cwu.org quoting the reference GS1.1/LTB 684/16. ‎As branches will be aware, CWU members in the Post Office are currently in a major industrial dispute over job losses, branch closures and the closure of the defined benefit pension scheme. These are the latest in a series of significant cost-cutting measures and it is difficult to see a long-term future for the company unless the Post Office changes course. Because the Post Office is still in public ownership, the dispute has an important political angle. The union is therefore running a major public and political campaign to exert pressure on the government, which is ultimately responsible for what is happening. This campaign, and the arguments we have been making, have resulted in widespread criticism of the Post Office and the government in both the media and Parliament. In response to this the government launched a public consultation on the future of the Post Office earlier this month. It is extremely important that we now use this to get public support for our key demands and ensure that the consultation exercise does not provide the government or the Post Office with an excuse for not changing course. We are writing to you because we need the whole of the union to get behind the next stage of our campaign and support our Post Office members. We will be sending out postcards, which respond to the consultation, to every branch and we are asking you to collect signatures for these over the next three weeks. The postcards call for an immediate halt to the cuts and a fundamental change in direction from the Post Office to protect our members’ jobs and what is a cherished public service. We would urge branches to make every effort to get as many postcards as possible completed – by both the public and our members – and return these to CWU Headquarters before 12th December (these should not be sent to the government directly directly). Our members in the Post Office are facing an extremely serious dispute and an unprecedented attack on their job security and terms and conditions. 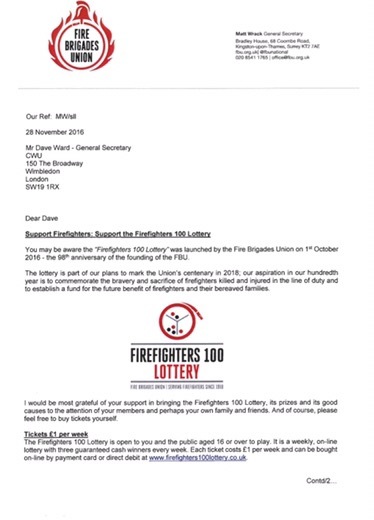 They need the whole of the union to get behind this campaign, just as we will ask all branches to support T&FS members in their disputes. Branches are therefore asked to treat this campaign as a priority over the coming weeks and target large workplaces and any public meetings and events to get as many postcards signed as possible. Any queries on the contents of this LTB should be directed to GSoffice@cwu.org and any requests for postcards should be made to mmurray@cwu.org. The union has received numerous reports of the attendance agreement contact strategy being abused in many parts of the country. The main abuse seems to be managers attempting to force members to attend face to face meetings as early as day 1 and threatening to stop pay if members don’t cooperate with the manager’s wishes. Please find attached a joint statement covering what should happen when members are not able to attend work. The agreement reiterates the key points of the contact arrangements in the attendance agreement. All reps and branches are encouraged to use this joint statement to ensure adherence to the agreement. If managers continue to abuse the procedure, please ensure you contact your divisional representative who will then raise it with the divisional head of attendance. This LTB is being issued further to LTBs 284/16, 532/16, 545/16 and 673/16. Further discussions have taken place with the Royal Mail Group Safety Health and Environment Team, Road Safety Team and Group Comms Team and subsequently some amendments have been made to the Activity Plans and the amended versions are attached for Branches information. As ASRs will know, the Road Safety Week Activity Plans were amended on 15th November and the amended Version 4 Plans were circulated to all Regions and Areas prior to the Road Safety Week Launch yesterday. The main theme and aims of the campaign remain the same, however it was agreed that wording lifted by Royal Mail from the ‘Brake’ material could be expressed in better terms and that has been done. SOBER – Don’t Drink and Drive and be aware of the ‘Morning After’ risk over Christmas and the New Year! SILENT – Don’t use a Mobile Phone whilst driving. SHARP – Take regular Eye Tests. The rise in ‘morning after’ arrests. Many don’t realise they are still over the limit. Christmas and New Year is a peak time for Drink Drive Offences and Drink related road accidents. It takes one hour for the body to break down one unit of alcohol. Most morning after drink drivers still have up‎ to 5 hours to go before becoming legally sober enough to drive. 50% of drivers under estimate how long it takes for alcohol to leave the body. ‘Morning After’‎ drink driving is on the increase with drivers putting themselves and others at risk! Hence the strong messages and awareness raising drive by “BRAKE”,”RoSPA”, “AIRSO”, “Think”, “Dft”, “Transport for London”, “Police”, “Ambulance Service”, “Fire Service” and others which the Health Safety and Environment Department fully supports. The campaign is all around improving road and driver safety, supporting, coaching and assisting drivers. This month is the ‘BRAKE’ road safety charity’s annual, UK national roads safety week, so the Royal Mail November Quarterly Road Safety Week (RSW), working with the CWU and Unite/CMA will be focusing on jointly supporting the National ‘Brake’ Road Safety Week. CWU ASRs will be fully involved as set out in detail in each of the Activity Plans via full input participation and support. National Road Safety week is an initiative created and co-ordinated annually by “BRAKE” the Road Safety Charity, supporting and encouraging organisations, such as Royal Mail and the CWU to raise road safety awareness and prevent needless road deaths and casualties year-round. It also provides a focal point for professionals working in road safety to boost awareness and engagement in their work. The CWU Health, Safety & Environment Department has been actively supporting the campaign annually since 2003. Every 30 seconds someone somewhere in the world is killed in a road crash. The misery of road death and injuries caused by vehicles is a shameful epidemic that we should all try to reduce. For any company with staff who drive for work – whether it’s a fleet of commercial vehicles, company cars – ignoring fleet driver and road safety can cost dearly. Managing road risk is also a fundamental part of an employer’s legal and moral duty of care towards its employees and members of the public. Driving is the riskiest activity most employees engage in. Road crashes account for 39% of work-related deaths in the European Union. The Royal Mail Safety Team and CWU Health and Safety Department have agreed to work together on fleet and driver safety, raising awareness and standards, gaining buy-in, managing and reducing the risk to drivers, vehicles, and journeys; and to continually improve fleet and driver safety. As previously stated, the initiative is corrective and supportive not punitive. Participation remains voluntary and is encouraged. An Activity Plan for Front Line Managers which focuses on completing 4 key activities throughout the week. An Activity Plan for all other managers which asks Managers to focus their SMATs or Observations. An Activity Plan for CWU Area Safety Reps which asks the ASRs to focus their Safety Inspections on the completion of the front line manager activity plans which support the ‘National Brake Road Safety Week’. Please see attached the AMENDED/UPDATED Royal Mail road safety week activity plan materials. The Royal Mail Group Regional Safety Health and Environment (SHE) Teams covering Royal Mail, Parcelforce, RMSS have been asked to liaise with the ASRs from both Unions to discuss participation and support with the road safety week’s activities. ASRs were asked to follow the ASR activity guide and schedule for the week. During Road Safety Week ASRs are asked to focus their daily Workplace Safety Inspections on a number of Units, preferably high impacting units and liaise with line managers to agree which high impacting units should be focused on and visited/Inspected during the November National Road Safety Week (RSW).